The plot is simple: Professor Henry Higgins takes up Colonel Pickering’s challenge to turn Cockney flower girl Eliza Doolittle into a genteel lady by teaching her to speak proper English. The performances were good, as far as I could tell. Quite liked the set design and the costumes. The Ascot costumes were the most impressive – as they were in the movie. I find the over-the-top hats hilarious. Speaking of Ascot, am I the only one who thinks the Ascot scene is the best in the whole thing? I think it’s a fun lampooning of the stiff British upper lip; it’s so amusing to have them talk (or sing) about “frenzied moments” and being “keyed up” whilst standing like statues with haughty expressions on their faces. And some of the funniest dialogue comes out in that scene, what with Eliza’s happily quoting “The rain in Spain falls mainly in the plain” when the subject of weather comes up, and then confusing the fine ladies with her talk about her aunt’s supposed murder and that same aunt’s fondness for gin. My biggest issue with the story – both on screen and on stage – is and always has been the ending. I could never understand why she would go back to Higgins. I guess it’s implied that there’s a romance there, but I never felt one jot of romance between them. “I Could Have Danced All Night” is a lovely song, but it just makes me think, “Really, Eliza? Really? You like Higgins that much?” Apparently Shaw’s Pygmalion ended with Eliza not going back to him and planning to marry Freddy Eynsford-Hill instead. Freddy probably isn’t the most sensible choice for a husband, but it would have seemed more rational (given the timeline of that story) than Eliza’s deciding to go back to Higgins. The ending aside, I enjoyed the show. 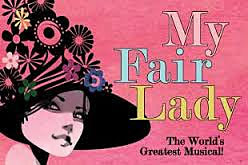 I like the songs, I approved of the production design in general, and the cast performed well. Yes, I was disappointed by the lack of an Embassy Ball scene, and the whole thing was too long, but I still liked it.